Four anti-drone resisters were sentenced tonight [July 29] in Judge Joseph J. Zavaglia's DeWitt (NY) Town Court for alleged trespass at a "die-in" on April 28, 2013, at Hancock Air Base, home to the 174th Attack Wing of the NY National Guard, just north of Syracuse, NY. The four defendants are: Joan Pleune of Brooklyn, Beverly Rice of Manhattan, Ellen Barfield of Baltimore, and Jules Orkin of Bergenfield, New Jersey. Pleune is a former Freedom Rider; Barfield, Rice and Orkin are active with Veterans for Peace. At their four-day trial this past June, the six-person jury acquitted the four of disorderly conduct and obstruction of government administration. After hours of hearing motions argued by attorney Lew Oliver, and denied by Judge Joseph Zavaglia, the defendants were sentenced to a one-year Conditional Discharge, with a two-year permanent Order of Protection for Hancock Base Commander Col. Greg Semmel. Joan and Bev demanded jail time and were re-sentenced to 15 days in the Onondaga County lockup -- with an OOP, of course. In his sentencing statement, ADA Peter Hakes said that the case was not about the defendants' First Amendment rights but about killing people with drones. On this point, he is in sound agreement with the defendants. It might appear that he "got it." But his claim also might be understood as a preemptive shot at undermining any appeal that might be in the works. 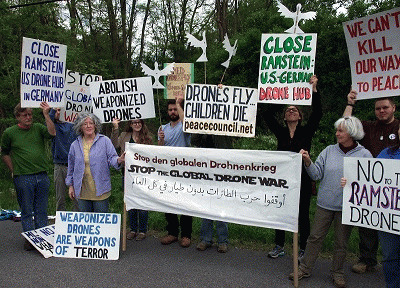 The four are members of Upstate Drone Action Coalition -- a scrupulously nonviolent, loosely-knit grassroots network which, since 2009 has actively opposed the Hancock Reaper drones flying missions over Afghanistan. The Reaper, an unmanned robot, is notorious for violating international law by killing, maiming and terrorizing civilians in several U.S. undeclared wars. There have been over 160 anti-drone arrests at Hancock resulting in bails as high as $10,000, numerous trials, many incarcerations, and Orders of Protection (a legal device usually meant to protect spouses and other vulnerable persons against violence). All four were identically sentenced to one year's conditional discharge, $250 fine, $125 court costs and a two-year order of protection. Both Pleune and Rice told Judge Zavaglia, through their attorney Lewis Oliver, that they would not agree to the conditional discharge -- which led him to sentence the two to 15 days in Jamesville Penitentiary. Pleune and Rice were taken from court in handcuffs.